On 15th August, the weather was hot, humid and overcast, but AMDA conducted its support activities at the regular three sites, Sunwork Soja (Soja City), Sono Community Center (Kurashiki City, Mabicho) and Okada Elementary School (Kurashiki City, Mabicho). The AMDA team was joined by various volunteers, including one public health nurse from Kuroshiocho, Kochi Prefecture, which is a member of AMDA’s Platform for the Great Nankai Trough Disaster*, and some volunteers from Okayama Prefectural University, which has signed a Memorandum of Understanding (MoU) with AMDA. *AMDA’s Platform for the Great Nankai Trough Disaster is a disaster-response network of municipal governments, medical institutions and private businesses, etc. to prepare for the expected Nankai Trough Disaster which is said to be expected to hit Japan in the foreseeable future. For both 14th and 15th August, AMDA dispatched one public health nurse and one coordinator to Sunwork Soja (which held 36 evacuees as of 14th August). The public health nurse went on rounds within the site to check the health of all of the evacuees. On the 14th, milk and cans of bite-sized fruit were distributed to the evacuees as a result of an AMDA coordinator speaking with a Kurashiki City nutritionist the previous day, and the evacuees were very happy. On the 15th, the public health nurse and coordinator conducted the regular activities such as conducting exercise routines for the evacuees and taking them on walks. Upon hearing that the 15th was to be the last day of AMDA’s activities, one evacuee said “AMDA was there for us from the very start.” The public health nurse, who had worked at Sunwork Soja for three days, said “the evacuees welcomed me warmly and with smiling faces, and they supported me.” She felt that the fact that there were no partitions between the evacuees led them to have a sense of security, being able to see that they have people watching over them. Regarding the acupuncture services being carried out every morning, on the 14th, seven evacuees received acupuncture treatment from three acupuncturists. One of the evacuees received acupuncture from AMDA for the first time and said that he was truly happy that he did. On the 15th, hearing that it was the last day, eight people made use of the acupuncture service, the largest number since the program started there. The AMDA staff heard various positive comments, such as “thank you to AMDA for supporting us with all their effort until the end” and “I feel much better now. Thank you”. From 26th July, the start of the acupuncture program at Sunwork Soja to 15th August, the last day, the AMDA Acupuncture Team provided a combined total of 91 treatments. On the 14th, AMDA dispatched four acupuncturists and 12 people received acupuncture treatment. One patient had been suffering from lack of sleep, but they said that the treatment took their fatigue away and they left feeling relaxed. On the 15th, the acupuncture team consisted of three acupuncturists who provided treatment to a total of 20 people. As this was the last day of AMDA’s acupuncture program, AMDA provided the patients with a list of local clinics where they could receive acupuncture treatment. From 14th July, the start of the acupuncture program at Okada Elementary School, to 15th August, the last day, the AMDA Acupuncture Team provided a combined total of 522 treatments, many of which were for repeating patients. Regarding the massage treatments, the masseur provided massages to seven people on the 14th and five on the 15th, bringing the total number of massages to 200 (beginning on the 11th July). Not just those who received massages, but the masseur herself was very happy that she had the opportunity to participate in this program. As for the feet washing, five people on the 14th and nine people on the 15th had their feet washed in cool, mint-oil water. One person said, “I can’t get acupuncture, but I just came here to chat”. 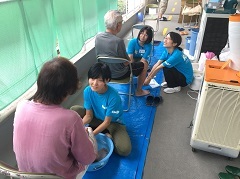 Since the feet washing service began on 22nd July, 242 pairs of feet were washed. AMDA used the classrooms at Okada Nursery School and Okada Elementary School in the hope that it could ease the physical and mental stress of the evacuees (and the staff supporting them), at least just a little, via its acupuncture, massaging and feet-washing services. Many of those who visited the AMDA Care Room for the first time were in pain, stressed and anxious. However, through receiving acupuncture, not only was their physical pain relieved, but they smiled and were more open to conversation the more they received treatments. Being able to see the evacuees smiling greatly encouraged AMDA’s activities. AMDA has been cooperating with “Bridge for Fukushima” (BFF), an organisation that focuses on the regeneration of Fukushima since the earthquake and tsunami in 2011 (whose president is a former AMDA staff member), to help with the dismantling of the facility where those who are evacuating at Sono Community Center used to live before it was destroyed by the current disaster. 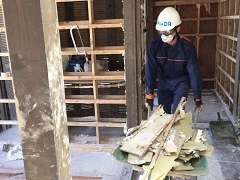 From the 14th to 15th, BFF sent six volunteers to the area to help deal with the remaining water, mud and the disposing of the facility’s dismantled materials. As it was very hard work conducting this activity in the sweltering and humid Japanese summer heat, AMDA dispatched a nurse in case of any injuries and to make sure plenty of caution and rest is taken to avoid the volunteers collapsing or getting heatstroke while working. The volunteers endured the heat and said things like “what I did may be insignificant, but I’m glad I did it” and “I want to do more. I want to see it to the end”. This activity ended without incident. A Mongolian doctor from Ulaanbaatar Emergency Service 103 (AMDA’s partner organization) took part in AMDA’s relief activities in various locations in Soja City and Mabicho from 6th to 10th August. After visiting four evacuation shelters on the 8th, the doctor was stationed at the care room in Okada Elementary School for two consecutive days where she heard the accounts of the evacuees during the footbath treatment or while they were waiting for the acupuncture service. “I have been involved with AMDA’s relief work ever since my organization signed a partnership agreement with AMDA in 2013. While I was deeply saddened by what happened this time, I was glad to be able to communicate with the evacuees transcending the age gap or language barrier. I tried to talk to the elderly evacuees in the way I used to talk to my grandmother as a child,” the doctor said. As time went by, AMDA personnel felt a tangible change in the needs and attitudes of the evacuees. A nurse and a coordinator who were working at Mabi Community House Okada Branch were impressed by the sense of unity among the local volunteers who were going back and forth between the shelter and affected sites for the recovery work. While getting shocked by the appalling views of the damage in the area, they said the locals seemed to be really determined to overcome the struggle. “Although my house was submerged, the second floor was alright. That’s still better off compared to some of the inner districts where people’s houses were completely under water,” one of the victims said. Such strong words inspired the AMDA personnel to use this opportunity as a learning experience which could be reflected further onto future emergency relief including the Nankai Trough Disaster which may hit Japan in coming years. According to a medical coordinator who took part in the aid activities, the success of the relief activies owes to how each care givers and aid workers took care of each other in the environment where everyone tends to overwork oneself. It is the harmony that is essential in making the concerted efforts worthwhile. At Okada Elementary School where AMDA has been providing acupuncture and massage services, quite a number of people have started to move out of the shelter as some found a new place to live or relocated to elsewhere. It has been a daily scenery where the evacuees visit AMDA’s care room to say goodbye. Nothing makes AMDA therapists happier than to see people off who got positive again by the services they provided. AMDA will end all of its relief work on the 15th but will keep an eye on the further development on the ground. As an exception, the assistance at Mabi Community House Sono Branch will be continued until 31st August.